My Yard Art is a family owned business dedicated to sharing our love for the outdoors. We are very proud to have been a part of this community since 1994, opening our first store in Colleyville. 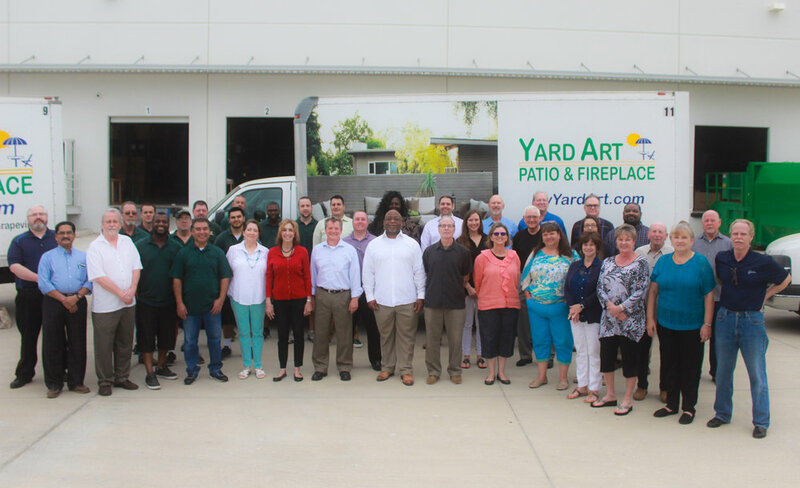 Over the past 20 years, we have added Five locations: Plano, Allen, Lewisville, Fort Worth and Grapevine. Yard Art Patio and Fireplace offers everything you need to create your own dream backyard. We stock casual furniture from bistro sets to ten person dining tables, over-sized spring chairs to cushioned sofas and everything in-between. Let our award winning team customize a comfortable place to entertain friends or to enjoy with family. Choose from sofas, loveseats, spring chairs, recliners, ottomans, lounge chairs and chaise lounges. We also stock a wide variety of tables in multiple sizes to complete any outdoor seating area including: coffee tables, end tables, tea tables and chat tables. Looking for that perfect set to compliment your pool? We provide multiple fast drying pieces within our sling collections. We have dining and swivel chairs, chaises, double gliders and even double chaises. Don’t forget to add an umbrella to any uncovered seating area to protect you from our Texas sun. We stock multiple sizes and fabrics and can special order from many, many more. We suggest using one of our 50lb bases, but offer more weight if needed. We are dedicated to providing excellent customer service. Our knowledgeable Sales Team is committed to delivering the ultimate shopping experience, right down to fresh baked cookies in every store. We cater to every individual’s taste. What better way to do that than with our in stock selection of outdoor rugs, paintings, and clocks. We carry a wide variety of accessories including decorative metal designs, candle holders, plates, and napkins. Ready to update your fireplace? We offer multiple gas log sets in many different sizes, colored fire glass, and raised linear burners. Choose from our decorative fireplace screens and fireplace tools, or customize your own set of glass doors. We also have many accessories including glowing embers, lava rock, pine cones and bark chip kits. Choose from a variety of styles of all-weather wicker, wood, cast aluminum and quality wrought iron. We stock furniture and umbrellas from over 20 different manufacturers…chances are, we have what you are looking for. We have six stores in the Dallas Fort Worth area: Colleyville, Lewisville, Allen, Plano, Grapevine and now in Fort Worth. Whether you’re from the Mid-Cities, Arlington, Grapevine, Southlake or Keller we would love to help you with your dream backyard. We have many clients from cities as far as Tyler, Sherman, Frisco, Argyle, and McKinney. Our furniture is also featured in homes in Frisco, Flower Mound, Highland Village, Weatherford, Coppell, Southlake, Westlake, Trophy Club, Fort Worth, Granberry, Rockwall, Allen, Lewisville, Carrollton, Dallas, Justin, Hazlet, Addison, Prosper, Melissa, Sherman, McKinney, Possum Kingdom, and Little Elm. Not sure where to start when planning your dream backyard? We offer free design consultations and will come to your home to help you out. We have delivery and set-up available. We also offer replacement cushions in stock and for special order. We look forward to helping you create the outdoor space you have always wanted.